In contrast to end-to-end mode, which places the main focus on security, Masterkey mode provides the maximum level of convenience. It not only imports users, organisational units and roles but also their links and affiliations. It can be synchronized to update the information and affiliations. In this scenario, Active Directory is used as a leading system. The following options are required to add new profiles. Profile management is started via the icon of the same name on the ribbon. *In the case of already created profiles, the encryption can no longer be changed. The domain field is used to define which domain is to be read. The value entered here will also be used for authentication if no alternative spellings have been saved under Other domain names. A local user (for example, the administrator) or an already imported user must be specified. The data will be imported under that user’s name. A *user is required to access the AD. The user should be formatted as follows: Domain\User. It must have access to the AD. Direct search is recommended for very large domain trees. The tree structure is omitted, elements can then only be found and selected via the search. 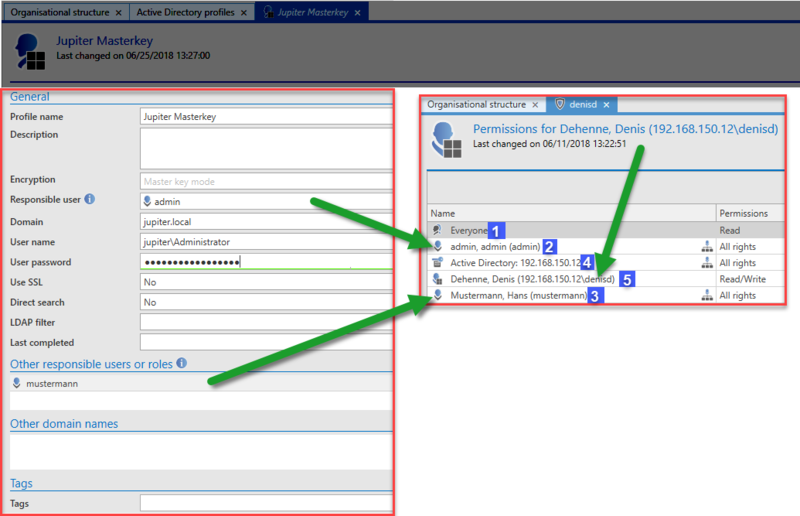 The filter can be used to directly specify an AD path as an entry point via an LDAP query. Other responsible users or roles can be used to define who is permitted to carry out the synchronisation with the AD. The option Other domain names can be used to save alternative spellings of the login domain. These must correspond to the spelling entered in the login window. For example, if a connection is being established to the domain jupiter.local or an IP address, the login can only be carried out with jupiter\user if jupiter has been saved here. !The master key is added in form of a certificate. It is essential to back up the generated certificate! If the database is being moved to another server, the certificate also needs to be transferred! Further information can be found in the section Certificates. You can start the import directly in the ribbon. A wizard guides the user through the entire operation. First, an organisational unit is selected for the import. If there are no organisational units in the database yet, as in this example, the data is imported into the main organisational unit. In the next step, select the profile you will use to import the data. Then, select organisational units and/or users for the import. A search is available for this purpose. As you can see, the organisational units Jupiter and Contoso contain items to be imported. The organisational units themselves will not be imported. The group 1099 Contractor is imported including all sub-elements. The check next to the group Accounting indicates that the group itself will be imported along with some of its sub-elements. The ticks in the last column ensure that the elements are observed in future synchronisation sequences. There are different symbols which indicate the elements to be imported. Right-clicking in the list will launch a context menu. It provides helpful functions for the selection of the individual elements. *If individual users cannot be selected for import, they have already been imported via an end-to-end encrypted profile. In the lower area you can specify whether the users just selected for import should be created as Light” or *Full users. The last page summarises which objects will be edited and in what form. It specifies the names of the elements along with their descriptions. The Status column specifies whether the object is added, updated, or disabled. The last column specifies the organisational unit into which the element is imported. The number of objects can be seen at the bottom. The server imports data in the background. The individual elements then appear in the list one by one. This may take some time, depending on the amount of import data. If the import was terminated, this is symbolized by a hint. The users and organisational units imported in Masterkey mode cannot be edited in Password Safe. Therefore, any changes must be made in AD and synchronized. AD thus becomes the leading system. Affiliations to roles are also synchronized and must be set in the AD. In organisational units or roles created in Password Safe, the users can be included directly in Password Safe. The rights will be issued as follows during the import or synchronisation. *If a user is imported, he will be given those roles that he also had in AD insofar as these roles already exist in Password Safe or have also been imported. Users who are imported using this mode can log in with the domain password. Please note that no domain needs to be specified when logging in. Of course, the login process can also be supplemented with multifactor authentication. 1. In Master Key mode, all users will be issued with the read right. *All users and roles issued with rights to the imported object also receive its rights key. During synchronization, all relevant information for users, organisational units and roles (names, email, etc.) is updated. Changed affiliations for roles are adjusted. Likewise, users are activated or deactivated according to the settings in the AD. 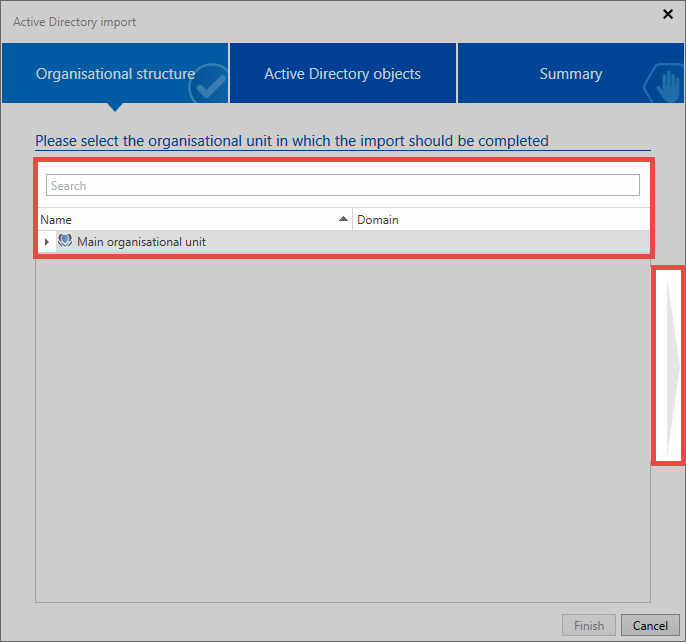 If the membership of organizational units is to be changed, this can be done by Drag & Drop. New users and correspondingly defined roles are imported. *If the tick was not set in the Synchronisation column when a user is imported, no changes are made. The synchronization can be started manually at any time via the corresponding button in the ribbon. Select the required profile and start the synchronization. As is the case with the initial import, the synchronization runs in the background. A hint indicates that the process has been completed. The synchronization can also be carried out automatically. This is made possible via the system tasks. If a user is deleted in Active Directory, it is also deleted in Password Safe during the next synchronisation. For this purpose, it is necessary for the user to be imported as a synchronisable user. 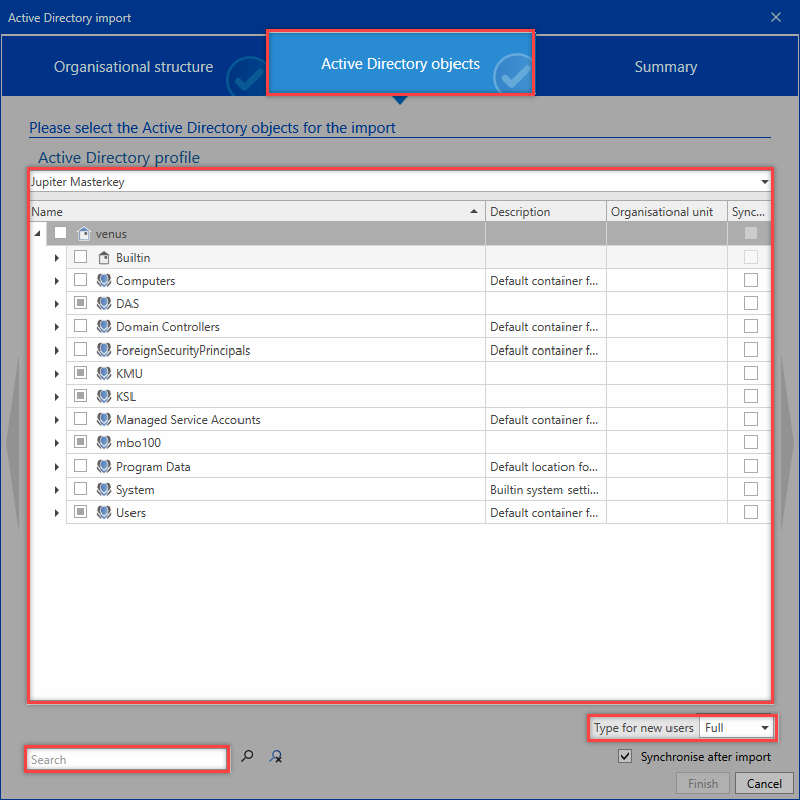 If the user is only deleted from Password Safe but retained in Active Directory, a synchronisation needs to be carried out to delete it from the database. For this purpose, the wizard is called up via import. The first step is to select an organisational unit. This has no effect when simply deleting a user. The second step is to search for the user. Both ticks are removed. After checking the summary, the process is concluded. The synchronisation is completed and the user is deleted from the database.